See Flerb's Balanced Death Moodlets for an up-to-date version with additional great features. Updated - Version 3 of the mod downloaded prior to today (February 24, 2016) had a bug which caused most Sims to grieve the death of a "loved one" even if they didn't care much for that sim. This has been fixed with the latest update to the mod. Be sure to remove the old version of the mod if you update! 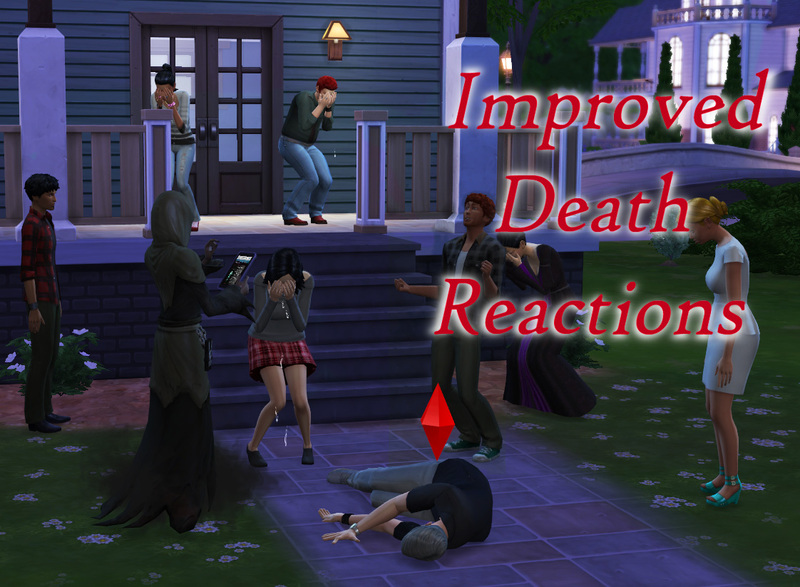 This mod for The Sims 4 will improve sim reactions to a nearby death in several ways. Sims will react from further away and even if they do not see the death take place. Sadness levels and durations have been tuned to more appropriately match the relationship towards the dying sim. As with the Traumatic Divorce for Children mod, news of death cannot reach sims on another floor or not on the current lot. However, the chances of reacting to death are improved by triggering the reaction continuously throughout the entire death sequence, this solves the problem of sims not reacting simply because they can't find a route to a nearby location to perform their greiving by making them retry again in five minutes. The mod works well with both FlorianPTME Emotional Overcharge and Snaitf's Disable Autonomous Mourning mods. Applies to sims who are a declared enemy. Happiness level increased from 3 to 4. Duration of happiness increased from 2 days to 4 days. Applies to strong negative relationships (-50% or lower friendship). Gives sim a happiness level of 2. Duration of happiness is 1 day. Must have a strong friendship or romance relationship (85% or higher friendship, or 50% or higher romance). No longer applies automatically to family or weak romantic relationships. Duration of mourning is increased from 2 days to 5 days. Applies to good or best friends that are not loved ones. Gives sims a sadness level of 4. Duration of mourning is 3 days. Decreases the sadness level from 5 to a sadness level of 3. Duration of mourning is increased from 2 days to 3 days. Applies to a neutral (weak) relationship with a family member, spouse, or fiance. Gives sims a sadness level of 2. Applies to a neutral relationsip with no family ties. Decreases the sadness level from 2 to a sadness level of 1. Duration of mourning is decreased from 12 hours to 8 hours. This mod also modifies the "mourn at urn" action for a neutral sim, reducing the sadness time from 4 hours to 1 hour. Version 3 requires The Sims 4 to be patched to at least version 1.13.104.1010 (December 4, 2015). Use version 2 if your Sims 4 game is patched to at least version 1.5.149.1020 (April 13, 2015). This may be of interest if you are experiencing a conflict and know how to debug such issues, or if you are creating another mod affecting reactions to death and wish to incorporate these changes to eliminate conflicts. If you do create another mod using these changes, I would appreciate receiving credit. Big, BIG thanks go to Velocitygrass for the Sims4XmlExtractor and Sims4Data tools, Snaitf for Snaitf's FNV Generator and, of course, Kuree and all the others at Sims4Group who have put together the S4PE tool. The XVI32 hex editor by Christian Maas was also used to modify the new DATA resources. Use only one of the versions depending on what patch level your game is at!